I've thought about writing blog titles that aren't outright lifted from musicals, but... why? So after I picked up my blanket on Saturday, the songs that came up next on the radio could only have been timed better if my life were a '90s teen sitcom. (Which, to be fair, it sometimes seems like.) I couldn't even tell you what radio stations my car has preset; I didn't change them after we got the car, because the person who owned it before me has reasonable taste in music. So I sang along to both. Still happy. Happier, probably, that I was having such an upbeat day. Goodness knows I know the power of songs for changing my mood one way or the other (and presumably everyone's, although I suppose there are some who don't interact with the world in this way)--there's a reason I've had to cull my iPod list a bit. No "Empty Chairs at Empty Tables" for quite a long while now. I pulled Jason Forbach's "Revolutionary" from the list after one weepy listen while I was mid-run (and I'm pretty bummed about that, because it's fantastic AND I just bought it-- but I'll try it again in a few months). I even had to pick and choose from among which songs from It Shoulda Been You and Hamilton get on the autofill list and which don't--more recently bought songs that are sitting around unheard. But for all the unheard and temporarily unbearable songs, and it's a list that's much longer than the few I just named, there are more that are very hearable. There are more that I can listen to and feel better for having listened. And there are the occasional surprises, like "See You Again" and "Unwritten," that show up on what could have been an awful day and make it even better. I love that. So maybe this is what the beginning of healing feels like, or at least what one good day is like. Maybe I'll manage to scrape together a few more. It's too big for me to take my own picture, unless I move all my furniture and lay it on the floor, which I'm not willing to do. It's a bit bigger than queen size. Eventually, when I'm ready, I'll probably put it on my bed. Unless I move to a taller house and decide to hang it up instead. The quilting is great. I told the woman who made it to surprise me with the backing, and she went with this nice chocolate brown (since, as she pointed out, Chadwick had a fair number of brown shirts, so it went well with the front). 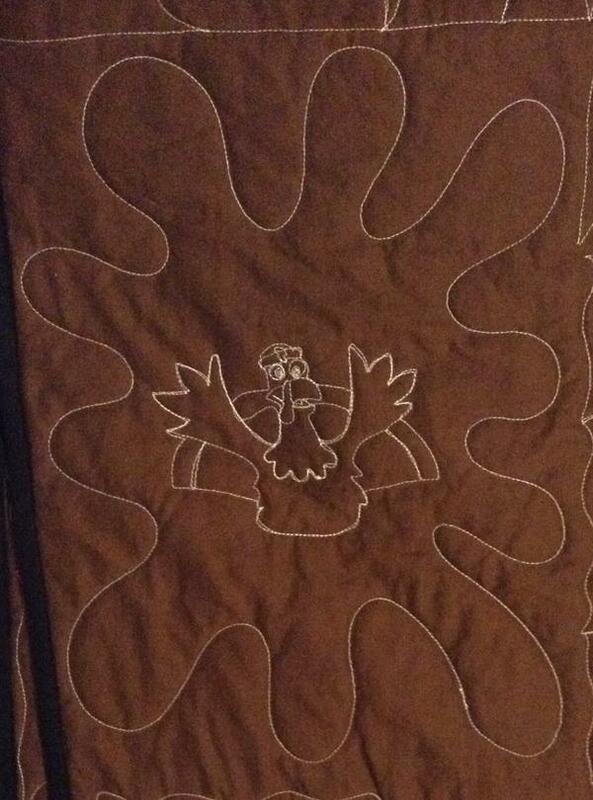 Some parts of the quilting matches up with what's on the front side, like this turkey. It's the reverse of the Turkey Trot shirt in the middle of the right-hand side of the quilt. So, I'm really glad I hired someone to do this instead of doing it myself. I'm even more glad I found Too Cool, since they've been nothing but helpful since my first email to them. And it was an awesome bonus that they have a local contractor, so we got to meet in person when I took her my shirts and again today when I picked up the finished product. I was afraid getting it back would send me into another tailspin of grief, but so far I'm all smiles and no tears. A step in the right direction. I knew being friends with authors would come in handy! I messaged said friend a few weeks ago and told her that I'm finally working my way through my neglected to-read list that I had to put to one side while I was still in grad school, and asked where I could purchase her book. Sad news: You can't right now. Happy (for me) news: She arranged to have a copy sent to me. I just turned in a bunch of library books, so this & my other new books from a couple weeks ago are next on my list. Don't talk to me; I'm reading. Just kidding; totally talk to me. What are you reading (or writing, or watching) this week? Had another one of my brain-addling "two trips to the theatre in the same week" weeks. I really need to stop doing that. However, what's done is done. A friend asked if I'd like to go along to a dress rehearsal for Ballet Austin's Hamlet on Thursday, I texted back an all-caps "YES!!! ", and away we went. It was a beautiful show, and while it's hard to pinpoint my exact favourite moment, it was probably the beginning of Act II, which starts with Ophelia's funeral. However, Ophelia's death scene at the end of Act I was also amazing, and Laertes' grief at the funeral was almost painful to watch, it was so sad. During the intermission, we had a discussion among ourselves about whether Hamlet's heavy breathing at one point was genuine or acted--it could have gone either way, because he never stopped moving and we wondered how he was not exhausted. The show only ran for one weekend, so if you missed it it's too late, which is a real bummer. Check out Ballet Austin's Twitter feed for photos, videos, and assorted awesome. Incidentally, I tweeted something about not being able to find many of the Ballet Austin company on Twitter, and they promptly tweeted back with a list of handles. I have never been so well accommodated in my Twitter-stalking, and when I said so with my thanks, they said, "Stalk away!" What's not to like about that, y'all? @cheekysu Ballet Austin is also on Instagram! Stalk away! So, in the spirit of seeing more major character death on stage, Denise & I drove down to San Antonio on Saturday evening to see West Side Story. I don't have the knowledge or skill to do any kind of proper review, but I'll try: Mariela Flor Olivo's Maria was breathtaking, and she absolutely stole the show from her costar Kyle Krambeck as Tony. Poor guy was no match for her incredible voice and powerful emotion (not that he was bad; she was just that good). Rounding out my list of favourites were Matthew Lieber as Riff (holy freaking smokes. It's a crying shame that Riff dies at the end of Act I. He was amazing), Alyssa Lopez as Anita, about whom I can't say enough nice things, & Eric Garcia as Chino, whose emotion grew as the show went on. He was powerful in Act II. 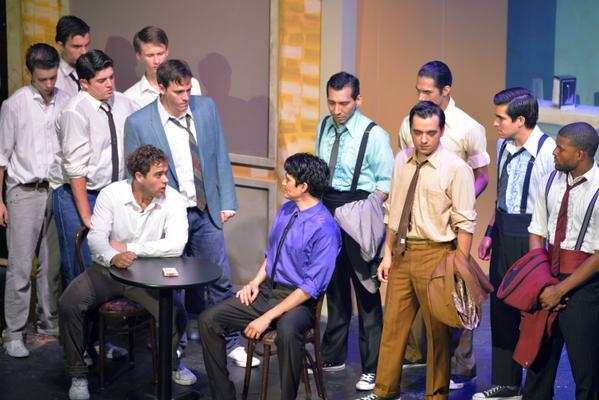 The choreography was fun, as it always is in West Side Story, although Denise said at intermission that it's hard for her to believe these guys are all so tough when they keep dancing and snapping at each other. Tee hee. My quibble with the show is that Anita doesn't get sufficient time to grieve for Bernardo (i.e., none). That's always bothered me about West Side Story. Maria gets a scene of crying and screaming (during which I also did a lot of crying--emotional girl is emotional), whereas Anita gets a song. That she shares with Maria. Not. Enough. Next up? The Little Mermaid at the end of September, as part of the Broadway Across America tour series in Austin, for which I've finally found a cast list (I think). And there are some other local shows I'm pondering. Gosh, I love living in Austin. I was going to run this morning, woke up with a headache, and after 30 minutes of trying to fight it off, decided to blog about running instead. Hard as it may be to believe, I am still running! And more to the point, I still get regular questions about running gear. And since I'm a runner on even more of a budget than I used to be, I'm here to help with my suggestions for low-price running stuff. they pretty? I love Mizuno! Shoes: This is the biggest challenge for new runners and runners on a budget, IMO, because not only is this probably the most expensive running necessity, but there's also a huge disagreement among runners over what kind of shoes (or no shoes) are best. My first piece of advice, then, is to always, ALWAYS listen to your body. When you're trying out something new with your feet, pay attention to the weird twinges or strange pains to be sure they're a normal part of adjusting and not a sign something is wrong. Rest, ice, stretch, and all that good stuff in between runs. In short, take care of your feet. Now, as to where to get them: I recommend finding a place that will do free gait analysis for you so they can make recommendations about what shoes to get--for example, I overpronate, so I buy motion-control shoes. When it comes to buying, I get my beloved Mizunos from Academy Sports (a chain store) in low-budget times and from a local running store in more comfortable times. If Academy doesn't work for you, I also recommend Sears or Target for budget shoes. I don't recommend Walmart because I've never been happy with their selection of running shoes. They have too wide a demographic to be much use in this area, I'm afraid. You can also find deals on Amazon pretty often, especially if you know your brand & size already. Wicking clothes: It's totally possible to run in cotton t-shirts. I did it for years. But sooner or later, you'll get a wicking shirt from a friend or from an event you entered and you'll wear it and wonder why you put up with sweat-laden cotton for so long. This is an area where you can basically spend as much or little as you'd like. I recommend finding something with a securable pocket (zipper, flap, something) for your keys and phone, whether that be in the shirt or the shorts (I have one of each). The lower budget items tend not to have pockets, FYI, so it may be worth it to find one piece that you like that costs a bit more but has a pocket and then fill in the rest with less-expensive stuff. My one item is my new Floravelo shirt, which is beautiful, comfortable, and has a nice double pocket at the side that holds my phone and keys without bouncing. I got it on sale at an event, which I recommend-- any running or cycling expo will have lots of high-end clothes that come with nice discounts. Great place to find your one helpful piece. All the rest of my workout clothes (well, nearly all... read on) come from Sears. I think their generic brand is Everlast. I've been very happy with everything I've gotten from them. Again, I also recommend Academy or Target, and can't un-recommend Walmart strongly enough. Don't even bother. Their stuff is no good. Almost forgot socks! I have nice wicking socks now, mostly picked up at running expos or as race swag through the years, but socks have never been a big deal for me. My feet tend not to get blisters (yes, I'm very lucky), so I can run in cotton socks if need be. Sports stores will have wicking socks, as do most department stores (but you need to know what you're looking for). Because of my circulation issues, I usually wear knee-high compression socks that I get online from Pro Compression when they're having a sale. But that's not necessary for everyone. Sport bra: I have only ever been happy with bras I got from Academy. I could with reservations say go ahead and look at Target. I can't recommend Sears here--I've gotten a couple of their bras in the past, but they wear out too quickly to be a reasonable recommendation for someone on a budget, because you'll just be back buying another one in a few weeks' time. Under Armour is my preferred brand for sports bras, and yes, they're a bit pricier than some others, so you may prefer a different brand. Just make sure you get one that fits properly and is rated for high impact sports. Body glide: I love this stuff and can't recommend it enough to prevent chafing in all sorts of spots. However, I know the price tag can seem daunting--I have sticker shock every time! The good news is that a canister will last you for a while. The bad news is that you basically have to go to a sports store to get this, because department stores don't carry it. The okay-ish news is that you can use regular Vaseline (or a Vaseline-like product), which in my experience doesn't work quite as well, but it does work. Accessories: I have a couple of fuel belts--one I got at Sears for next to nothing, and the other Chadwick won in a contest. If you're running long and don't want to carry a water bottle in your hand, this is a good option. Be aware that every brand of bottle will leak eventually, and the cheaper ones may leak from the very first time you use them. I've owned a couple of watches through my running years, but mostly just use my phone. I'm already paying for it, anyway. I'd love to have a Garmin so I don't have to map my runs out ahead of time, but it's not a life necessity, and those things are super-expensive. Hats or visors are pretty much a necessity for sunny running, as is sunscreen. Protect your skin! I can't even remember where I got my visor, so I can't be much help here, but anything that gives your eyes a bit of shade will do. Just make sure it's a hat you don't mind sweating all over. Mid-run fuel: I use fruit snacks from HEB. I also like fruit leather, if you have it nearby (try the health food section at your supermarket), and in times when I can find them on sale I use Clif Shot Bloks. Make sure anything you get tucks into your pocket or fuel belt. It's not much fun to carry them the whole time. You really only need this if you're running for more than an hour. Oh, and I have an iPod. It's not a necessity and I can run without it, but I have a foolproof race day playlist that I love, and sometimes the right song can give you a boost midrun. I had a cheaper mp3 player for a while, so there's no reason it has to be an Apple product. This is another one where you could just use your phone, if you wanted, or go without. I have a harder time finding earbuds that stay put and don't completely block all sound (I run with one ear open to solve that problem), but Walmart has been a lifesaver here. Finally, something I can recommend Walmart for! You can get headphones cheaply there and they tend to last a while despite their low price tag. I am absolutely not willing to buy fancy sport earbuds that do the same thing but cost five times as much. I think that's it! My running gear solutions/recommendations. Remember, running makes you a runner, not a bunch of stuff, so if you can't or don't want to get all the things I've mentioned, you don't have to. Just remember to listen to your body and pay attention to anything that feels weird or off--knowing what all the twinges and aches mean will go a lot longer toward you having an enjoyable running life than any amount of gear ever could. Before we moved, Denise & I each had sizable giveaway stacks for the local thrift stores. I rummaged through hers, as is my wont, and rescued a couple of shirts I thought would be great for doing one of those t-shirt makeovers I'm always seeing on Pinterest. The orange and white stripey thing is one of hers that I stole. The green skirt was a workout shirt Chadwick got late last year that he only used once or twice, at most. He gained weight after his surgery in November so he had to go up a size in workout clothes, but was only able to start working out again gradually, so I really don't know if he ever wore it. 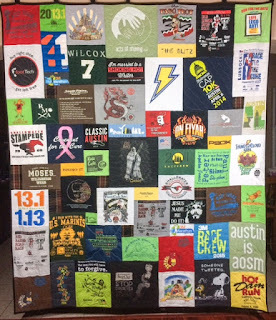 That being the case, it wasn't one I was interested in putting into his t-shirt quilt (which I still don't have, but I'll definitely share as soon as I do). Anyway, since it's wicking material it's nice and soft. I haven't worn this in public yet. Not sure if I'm brave enough. Although I suppose if I'm not, it was a bit of a waste to assemble it. I have a couple of other things I'm planning to make from old shirts, which I'll post as they're done. This one was fairly straightforward--cut, then sew--but the next one will take a bit more planning. And I'll try to remember to take before pictures. Have you ever remade old things into new things? How did it turn out? If you read yesterday's post about the summer reading program I participated in at church, you may have noticed that I didn't technically answer the question "How does reading aid your spiritual growth?". While answering, I didn't address the fact that I wasn't answering the question (except to take the long way round and come in by the back door, sorta), but I do want to talk about that a bit, because there were Reasons. 1) I don't actually know the answer. I usually don't figure out until much later that something has aided my growth in any area, and my spiritual growth is no exception. I should probably work harder to be more aware of what's going on in my own brain, but geez, that's kind of a scary place. There be dragons, y'all. 2) I don't read a lot of Christian literature, either non-fiction or fiction. That's mainly because after many years of trying to find Christian fiction that I like, I just gave up. Most of it is bad or bland or both. Francine Rivers is writing some great stuff, but most everything else I've read (or tried to read)... I just can't do it. Recommending A Million Miles in a Thousand Years is as close as I get to Christian non-fiction most days. But that's really not a spiel I want to deliver at church, not even by way of explanation that my reading doesn't directly address my spiritual life. I save that speech for when people ask me privately what books I recommend. 3) I told Denise when I was preparing to speak, "Reading is like breathing for me. How am I supposed to talk about it? What do I even say?" 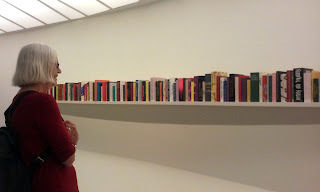 After I thought over that metaphor a bit, I realised it's a bit overblown--reading is more like eating than breathing. I might get busy for a while and not have the time to read, or even forget that I've missed out on reading much like I might miss a meal when I'm busy. But after a while, something in me will start to ache to be fed. And if I were to go too long without reading, key parts of who I am would start to wither and die. For my mind and personality to continue to thrive, I need a regular diet of books. But how do you explain something that fundamental to a group of people who don't necessarily have that same need? I can't do it. So I dive in with my current read and see where it goes from there. What fills a deep need in your life? Could you explain it to someone who doesn't share the need?